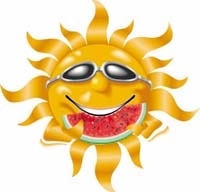 We're having a fund raiser Garage Sale on Saturday Sept. 28th from 8am to 4pm @ Harvester Lion's Club. We need stuff! We need volunteers! We need to get the word out. 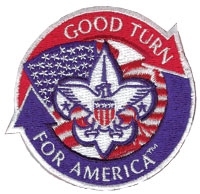 Contact Tisha Dillon our advancement coordinator at advance.pack530@gmail.com for any questions or help. Monday May 20th! The run in the St. Louis area http://www.rftw.org/. Since 1951 the Boy Scouts and Cub Scouts of the St. Louis area have been placing flags on the 130,000 graves at Jefferson Barracks National Cemetery as part of the annual Good Turn. This is our chance to formally honor the brave men and women who made the ultimate sacrifice for the freedom we cherish. This year’s celebration is Sunday, May 26th. Gates open at 11 a.m. and we should enter at the entrance of the National Guard base (adjacent to the cemetery). The precession starts at 12:30 and the ceremony starts at 1 p.m. Make sure to bring plenty of water and a snack or sack lunch, and rain gear (just in case). The Official Pack Bridging Ceremony, where each boy bridges to the next rank. Location Harvester Lion's Club Pavilion. We will be maintaining the path to Outdoor Classroom again this year, clearing paths and laying mulch. Join us in helping our community. Bring rakes, clippers, gloves and anything else that you think would help us make it all happen. 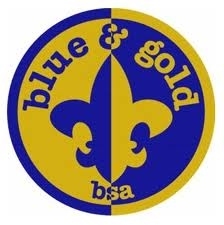 Blue and Gold is a chance for us to get together, share a meal, and celebrate several things. It is a chance for us to honor all of the many award winners from the Pinewood Derby this year! The theme of this year’s Blue and Gold is the 60th Anniversary of the Pinewood Derby! So we will definitely be celebrating those awards. Some of our scouts will be earning awards that they have worked on in their dens or individually, such as belt loops. 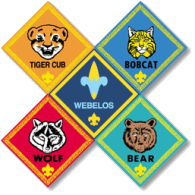 The biggest part of our celebration though will be the Crossover of our Webelos II! The Boy Scout Pack 533 will be on site to aid us in this part of our ceremony. On a fun note, there will be a cake decorating contest! These are intended to be a family effort, so be creative and remember our theme!!! -Lions' Club Cleanup Chair: Cindy Akihiro, currently holds this position and will be bridging over with her WeBeLoS-II son by February of 2013 and we will need somebody to succeed her in this capacity. NOW would be a great time to get with her on how to do this job and learn all her tricks, secrets, and "methods to her madness" to get this job done for our Chartering Organization. recognized as a position on the unit committee. "The Unit Religious Emblems Coordinator position was created to strengthen units by building an infrastructure that would create cohesiveness between units and district- and council-level volunteers, ultimately to better serve youth members in the realm of Duty to God. serve as the liaison to the District Religious Emblems Coordinator." Some pictures of some of the emblems that can be earned are included with the .pdf file along with some frequently asked questions and other information. If you are interested in either of these opportunities, see Cubmaster Scot Alexander, Cindy Akihiro (with regards to the Lions' Club) or me at our meeting tomorrow night or come to our next Committee Meeting Thursday November 8 at 7pm at the Castlio cafeteria. You can also email me at chair.pack530@gmail.com. 11/17 Scouting for Food PICK-UP! Saturday, November 17th • 9:30 am -- Meet at 9:30am in Castlio Parking lot. We will divide up and get maps and go collect food! We will then meet back at Castlio to count and load up trucks for delivery. Thank you in advance to everyone who makes this happen. Cubscout Pack 530 -- Making our community stronger!